With Men’s 5-in-1 Electric Shaver & Grooming Kit, you will gain a complete control in the palm of your hand. Highly versatile and ultimately convenient, this trimmer set will be the only gadget you need for your hair, beard and facial care. 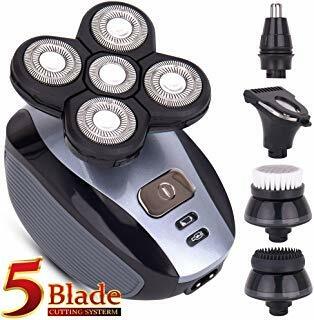 ✅ Versatile Functions – This trimmer is multifunctional with five detachable heads, giving you all you need for your hair trimming and facial care. ✅ Ergonomic Design – The ergonomically designed five-head shaver gives you a total control. Plus, the handle is comfortable to hold. ✅ Washable – The shaver head is washable, allowing you the ultimate convenience and speed you deserve. ✅ Cordless & Rechargeable – With 5 hours of charge time, you can use the trimmer for 45 minutes, cordless. ✅ Simple One-Button Operation – Despite the versatility the trimmer is extra simple to operate with just one button. Achieve your desired style, effortlessly.